NEW BRITAIN—Today, Mayor Erin E. Stewart joined POKO Partners, LLC to announce that the city has chosen the New York-based developer to build a brand new $58 million, mixed-use project adjacent to CTfastrak—New England’s first bus rapid transit system. POKO submitted their plan on March 10, 2016 to the city in response to a request for proposal to redevelop 125 Columbus Boulevard, the 2.26-acre site of the former New Britain Police Department. POKO’s submission will be recommended by the Mayor to the Common Council for approval at the July 13th meeting. 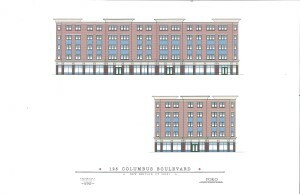 “Columbus Commons” will be a two-phase, mixed-use development which is set to include the construction of two complementary L-shaped buildings framing an interior courtyard. 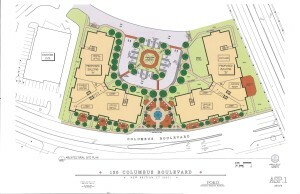 The courtyard will create ample open space for active and passive recreation, community events, artisan retail pop-ups, food fairs, even musical performances. “The buildings feature elements of active design, encouraging residents to move a round the commons: to live, work and play in this revitalized corner of downtown New Britain,” said Andrea Kretchmer from POKO. POKO will be seeking funding for the development from several sources, including: the Federal Housing Finance Agency, Competitive Housing Assistance for Multiple Families Properties, Urban Act funds, and others. The former police station was taken down over the last few months through funding from the state’s Office of Brownfields Remediation and the Department of Economic and Community Development. “Governor Malloy’s investment in transportation and brownfields is encouraging private development all across the state, and we are proud to be partnering with Mayor Stewart and the City of New Britain to bring new life to a long underused and blighted site in the heart of New Britain,” said Tim Sullivan, Deputy Commissioner of the Department of Economic and Community Development. POKO is currently undertaking a $26.32 million redevelopment of an abandoned mill in Stonington, Conn., and converting it into a 129,000-square-foot mixed-use development featuring 58 rental units and retail space. The firm has also worked with New York City to convert properties in the Harlem neighborhood into high quality housing. A sale price will need to be negotiated if the project gains approval. The land is currently appraised at about $200,000.